Multi-level Affiliate is the program in which multiple referrals gets the commission for the sale generated through their links. This program allows you to earn a commission by the adapting the referral process. Webkul has made the task easier by launching “Odoo Affiliate Multi-Tier Commission/Odoo Multi-Level Commission” which allows the admin to set commision for multi-tier referral affiliates. Now your affiliate can earn commission not only by the sales generated by their referrals. This method is one of the useful methods for significantly increasing the size of an online business and has proved to be a cost-effective measurable method of delivering long-term results. It also shows Multi-tier Referral Tracking with a graphical tree view. It allows creates unlimited affiliates. It provides automatic invoicing for Multi-Level Referral. 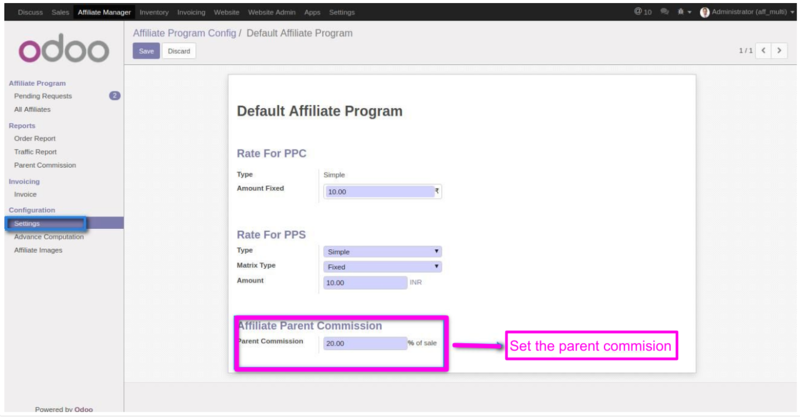 You can also set the different commission programs for Multi-tier Referral. It is very easy to handle admin options. Let’s have a look in the workflow of the module. So starting with the workflow of the module. The initial step is to set the commission program for Affiliate Multi-Tier. 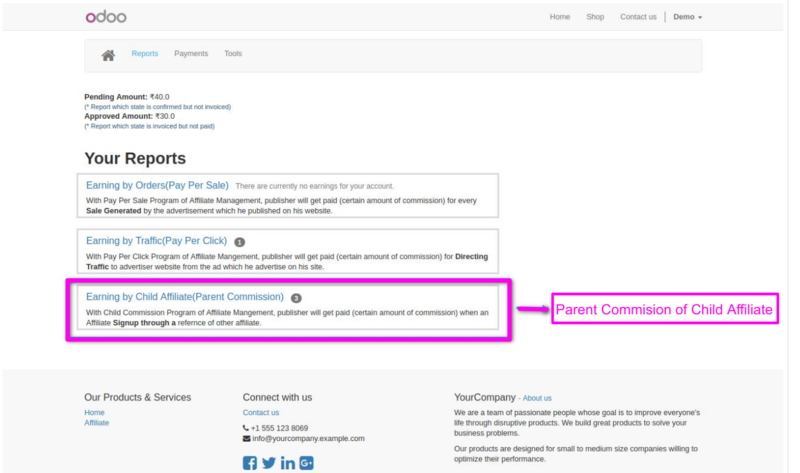 The menus for multi-tier affiliate commission appears under “Your Reports”. 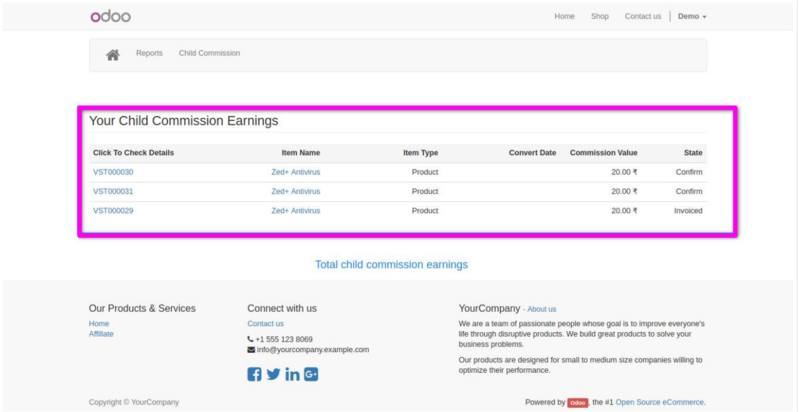 The list of all multi-tier commission appears under “Your Child Commission Earnings”. Affiliates are associated with parent affiliate. 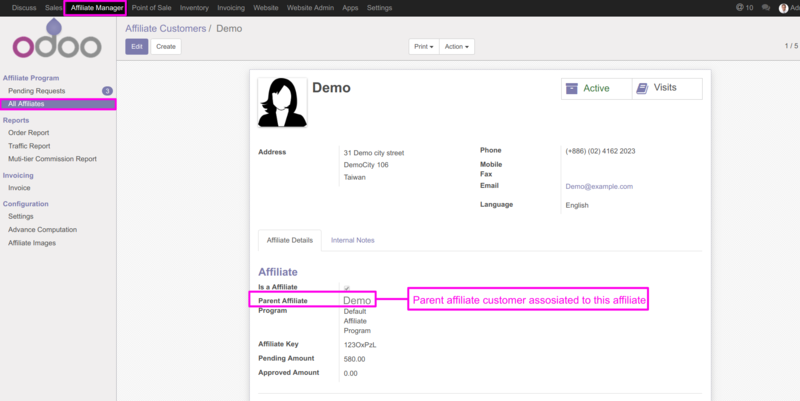 For example- An affiliate is associated with multi-tier customer affiliates(refer to the below screenshot). Admin has the right to review the Multi-tier Commission Reports. Multi-tier affiliate is like the assigning commision to all the child affiliates who are present in the network and is responsible for generating the sale. The commision is set by an admin who manages the commission of all the multi-tier affiliates who are present in the network for the earning the commision for the sale.